An early fruiting spine free blackberry with vigorous growth and superb fruit quality Adrienne usually starts to ripen a week after Silvan and a week before Waldo. In Southern England this is usually early July. The fruits are large, rather similar to Silvan, and are firm, long and conical. 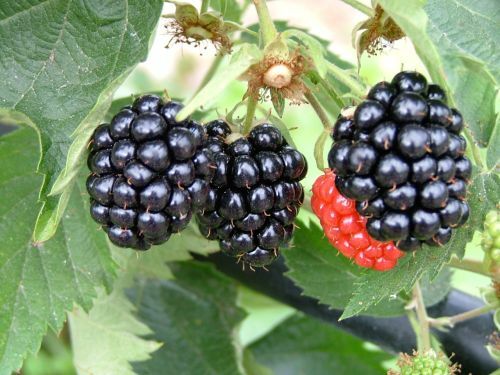 They have a bright and attractive appearance and the juicy fruits have a truly excellent flavour. Cropping potential is very high with the strong canes that are vigorous for a thornless variety. The fruit is well displayed to make picking easy from the short, stout, fruiting laterals. Bred by Medway Fruits, Adrienne is a hybrid between Silvan and an un-named seedling. If you require more vigorous cane growth than Waldo supplies then this is the variety for you.